Costa Rica Vacation Packages – Vacations Made Simple! Travel Advice for Your Next Costa Rica Vacation! With the help of My Costa Rica’s expert travel coordinators, you can save time, money and get the most out of your vacation to Costa Rica. My Costa Rica takes care of the details so your trip to Costa Rica is stress and hassle-free. All of our Costa Rica vacation packages can be custom tailored to your schedule, interests, and budget. We can include all the accommodations, transportation and tours during your stay in this lush tropical paradise. We’ve done our research and we are experts on Costa Rica vacations, resorts, hotels, tours and transportation options. My Costa Rica only recommends the best. Here we’ve compiled some sample travel itineraries to give you an idea of what we can offer. All of our travel itineraries can be modified to better suit your needs. 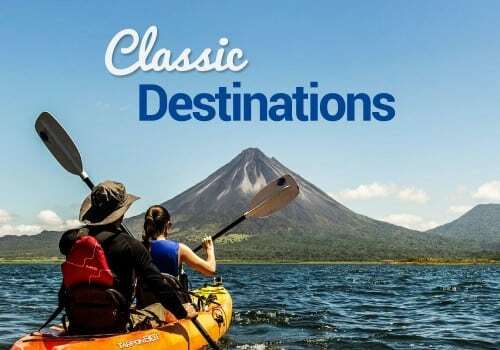 You can visit the iconic Arenal and soak in the hot springs and the beautiful La Fortuna waterfall or encounter on a challenging hike in the Arenal Volcano National Park. You can stay at all-inclusive resorts at Costa Rica’s famous beaches and perhaps take your very first surfing lesson in Tamarindo. There are so many choices and we can help you with all of them! Costa Rica Travel made easy! If you would like to take a tour, we can arrange all kinds for you. We can arrange for a canopy tour of the fabled mountains of Monteverde. You can go horseback riding along the sandy beaches of Guanacaste or hike in the tropical rainforest. Here you can spot some of Costa Rica’s famous wildlife such as hundreds of birds like the toucan and resplendent quetzal, tapir, howler monkeys and the white-faced capuchin.Scratch even more species of birds off your list by visiting San Gerardo de Dota! You can visit a world-renowned coffee plantation in the Central Valley. The Nicoya Peninsula can introduce you to the real Pura Vida vibe while you stay at a luxury hotel or all-inclusive resort.If you would rather visit the white sand beaches of the Caribbean coast, you can spot sloths in Cahuita National Park. 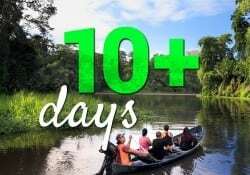 Or we can organize a boating tour of Tortuguero where you can see hundreds of sea turtles in the river network through the jungle. Do you want some real adventure? Then we can put together a white water rafting trip on the famous Pacuare river. For those days when you want nothing more than to relax, you can do so at one of Costa Rica’s many waterfalls. 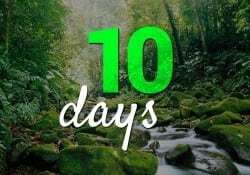 Are you getting ready to book some amazing Costa Rica Tours or an all-inclusive vacation? Take a look at the options below or Request a Custom Itinerary from one of our local travel experts. These classic vacation packages help you maximize your time here while visiting some of Costa Rica’s Top Attractions. They all make sense logistically so there’s no wasted time getting from one destination to another. Explore 3 Star, 4 Star & 5 Star options on this classic travel routes throughout the country. This is a collection of some of our favorite, signature vacation packages. These really unique trips showcase what Costa Rica has to offer and what our agency can do for you. 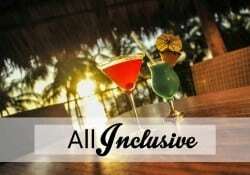 Keep in mind that all of our vacation packages can be customized to better suit your particular interests. 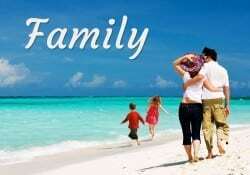 Do you have something special in mind like a family vacation or a honeymoon package? Let us know! People come to Costa Rica for many different reasons and a variety of interests. That is what makes this country so special, that it can accommodate almost anyone – from families to honeymooners to adrenaline junkies! Safe and fun for the entire family! Celebrate with a special someone! There are two international airports in Costa Rica and both have their pros and cons. The Juan Santamaria International Airport (SJO) is located in Costa Rica’s Capital offers a variety of flight options and is the hub for exploring the country. Located in the northern Guanacaste region, the Daniel Oduber International Airport (LIR) is close to many beautiful beaches and famous resorts. How long you stay in Costa Rica depends on how many Costa Rican destinations you want to visit. 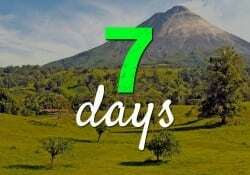 In a week you can visit 2 Costa Rica destinations – perhaps dividing time between the volcano and the beach. You can potentially visit 3 destinations if you have more time – adding the cloud forest or another coast. Costa Rica has so much to offer and the more time you have, the more you can see! Have a particular interest that you’d like to explore on your upcoming trip? Birdwatchers flock for a glimpse of the elusive quetzal, surfers search for the perfect wave, and fishing enthusiasts love to brag about “the one that didn’t get away”. Whatever you are hoping to do in Costa Rica, we’ll help you put together the perfect vacation package. Since we began operations in 2004 we’ve helped over 10,000 people plan their vacations to paradise and it would be an honor to help you as well. 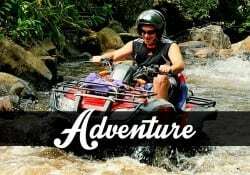 We specialize in Custom Costa Rica Vacation Packages and take the time to work with our clients to design something that fits exactly what they are looking for. We’ve helped to design trips for honeymoons, family reunions, destination weddings, educational tours, spring break trips and much more! We take pride in the fact that we do our best to get to know our clients and put together something special just for them. Come visit Costa Rica for the vacation of a lifetime! 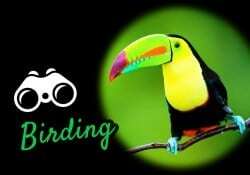 Home » Costa Rica Vacation Packages – Vacations Made Simple!